Weekly Winner: Apparently it is easy (and tasty) being green. Parsley gets a bad rap. Actually, I take that back — parsley gets no rap at all — it’s totally overlooked and ignored. That’s a shame. This bright, verdant herb really adds a lot more than simple “curb appeal” to a recipe. Take this salad for example: Chicken & Cucumber Salad with Parsley Pesto. The recipe comes from Cooking Light Magazine and if you’re looking for a hearty, healthy, very “green” salad, then this one is for you! Stir together chicken, edamame, chickpeas, and cucumber in a large bowl. Add pesto; toss to combine. Place 2/3 cup arugula in each of 6 bowls; top each with 1 cup chicken salad mixture. Pasta in any form makes me happy. I’ll take plain with butter, extravagantly layered lasagnas or a luscious mac-n-cheese. If it involves pasta, I’m in! Rigatoni with Ricotta-Sage Pesto and Walnuts, which I found in a recent issue of Milk Street Magazine, has all my favorite things – cheese, nuts, and herbs — if it had bacon in it, it would be the perfect!. Of course, there’s nothing stopping you (or me next time) from adding some bacon. Note to self! In a small microwave-safe bowl, combine the olive oil and sage. Microwave on high just until hot and fragrant, about 1 minute but check after 30 seconds; it should not sizzle. Cool to room temperature. In food processor, process the sage-oil mixture and parsley until finely chopped, about 15 seconds. Add parmesan and lemon zest and process until well incorporated, about 5 pulses. Transfer to a large bowl. Stir in ricotta, kosher salt and pepper. Bring 4 quarts water to a boil. Add pasta and 2 tablespoons of salt; cook until the pasta is al dente. Reserve 1/2 cup of the cooking water, then drain. 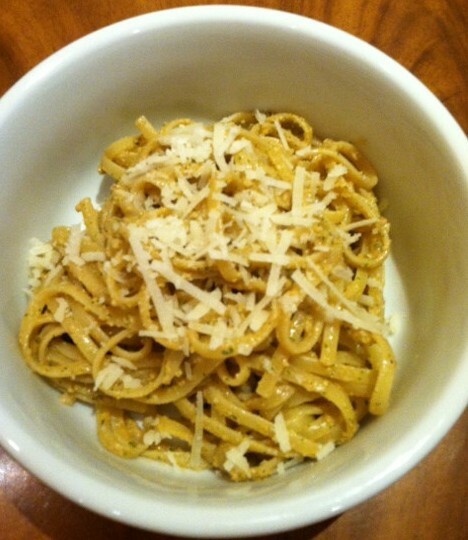 Toss the pasta with the ricotta pesto, then stir in the reserved cooking water; the pasta should be creamy. Serve sprinkled with chopped toasted walnuts and additional parmesan. 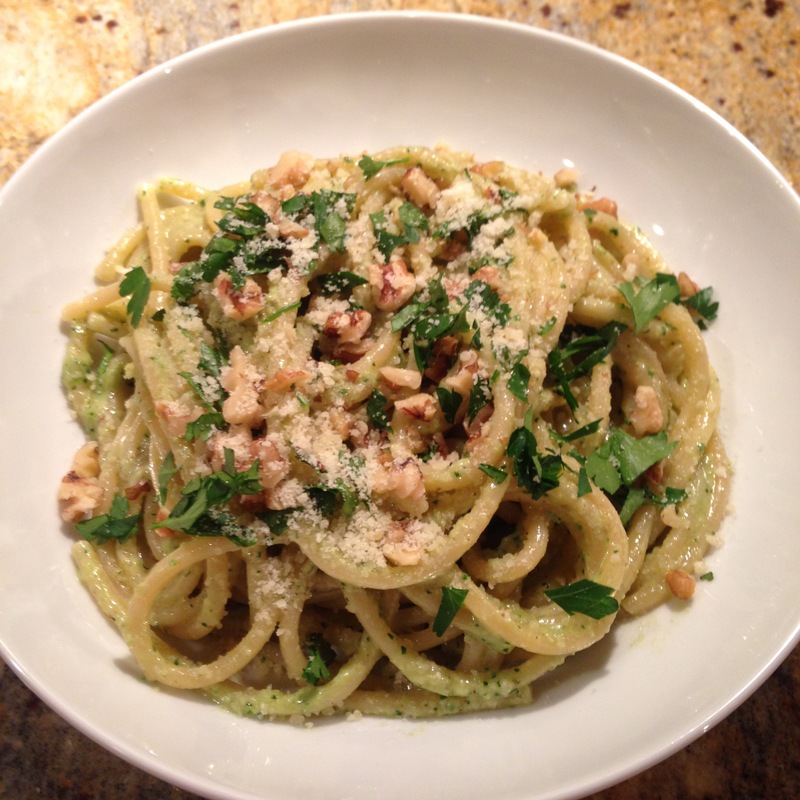 As I continue my quest to find different twists on the typical basil-pine nut pesto, I came across this dish. First of all, it was the magazine photo that got me. I was sold before I even knew it was a pesto. I mean this is one seriously pretty dish, isn’t it?? Then come to find out that this spaghetti is tossed with a tomato and walnut pesto. Now you’ve got me hook, line and sinker. Seriously? Is there anyway this could get better? Well, yes — add Italian Sausage! While the original recipe from Bon Appetit for Spaghetti with Tomato and Walnut Pesto is totally vegetarian, I’ve got a hubby who’s coaching marathon training and needs meat! At least, that’s my story and I’m sticking to it. This had nothing to do with the fact that I am constantly looking for reason to add pork products to any dish! It was all for him, I swear! So while deciding to try this luscious pasta last Friday, I decided to call an audible on two points: first (and most importantly) was the addition of Italian sausage. Second, I always have a huge selection of various pastas in my pantry and really love fettuccine, so that got swapped for the spaghetti. The end result (regardless of what pasta you use) is, gorgeous, creamy, pasta perfection – with pork! Preheat oven to 350°. Toast walnuts on a rimmed baking sheet, tossing once, until slightly darkened, 8–10 minutes. Let cool. Transfer pasta and sausage to bowl with pesto and add a splash of pasta cooking liquid. Toss, adding more cooking liquid as needed, until sauce coats pasta. Add basil and remaining tomatoes. The recipe is from Bon Appetit Magazine and caught my attention because it hits on some of my all-time favorite things. Bucatini has to be my favorite pasta shape. It’s substantial and chewy. Walnuts definitely top my list of favorite nuts (along with cashews) and I’m a big fan of pesto made from non-traditional ingredients. 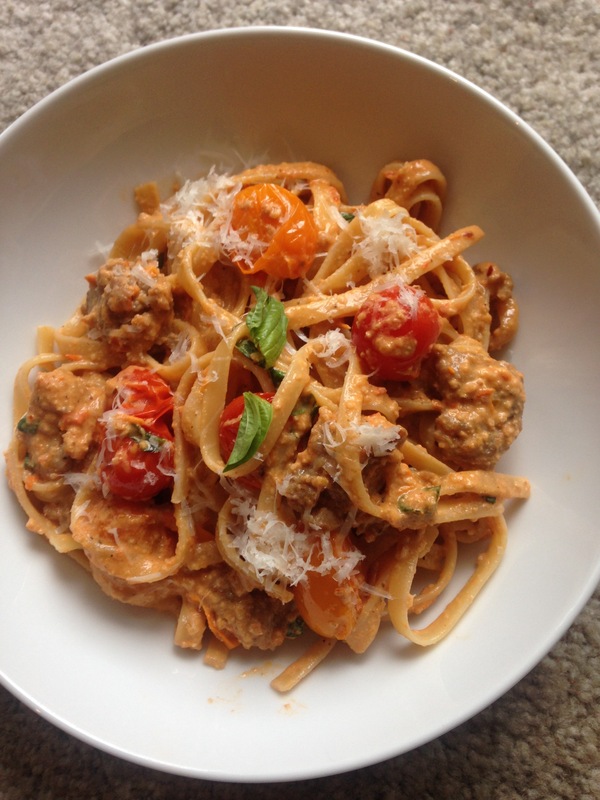 I also tend to lean toward pasta dishes that have relatively few ingredients. Simplicity is the key for me and in this dish, it just about reigns supreme. One more fun fact about this dish. When I decided to make it I realized that, although I’ve wanted shallow pasta bowls forever, I’ve never bought them. There is no excuse for this but every time I made a new dish, I regretted the fact that I didn’t have the perfect vessel to show it off. So last Friday I bit the bullet and before I shopped for groceries, I went to my favorite home furnishings store and picked these up. My pastas finally have a welcoming new home. Preheat oven to 350F. Toast walnuts on a rimmed baking sheet, tossing occasionally, until fragrant and slightly darkened, 8-10 minutes. Let cool. Cook pasta in a large pot of boiling, salted water, stirring occasionally, until al dente. Drain, reserving 1 cup pasta cooking liquid. Return pasta to pot and add pesto along with 1/2 cup pasta cooking liquid. Toss, adding splashes of cooking liquid as needed, until pesto coats pasta and sauce is glossy. Crush reserved walnuts with the flat side of a knife. Divide pasta among bowls and top with walnuts and more parsley. I have to admit it, I’m not a terribly “eco-friendly” person. I don’t fret over eating organic, I don’t have an electric car and I don’t lose any sleep over my “carbon footprint”. I’m not a juicer but I do tend to eat relatively healthy and generally believe locally sourced food tastes better and is fresher which is why I choose it when I can. 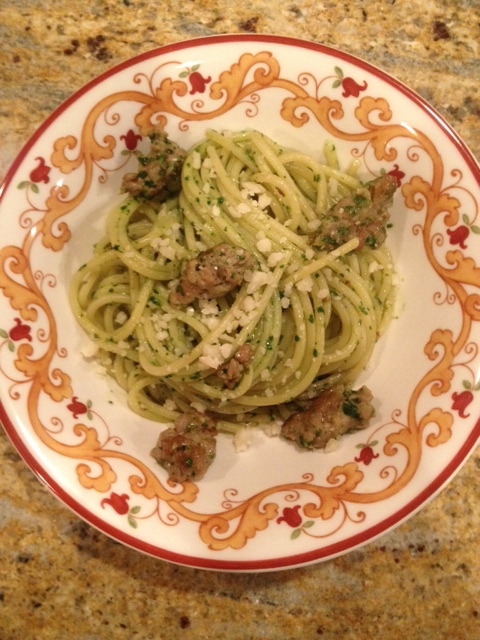 So, having said that I did decide to “go green” last night — with a parsley pesto. It was delicious. This is a very simple, honest-tasting pasta dish from Cooking Light Magazine that comes together in no time. And as I just discovered — sorry Kermit, but apparently it really is easy being green. Bring 4 quarts of water to a boil in a large saucepan or Dutch oven. Add pasta to pan, and cook 8 minutes or until almost al dente. Drain pasta in a colander over a bowl, reserving 3/4 cup cooking liquid. Discard the remaining cooking liquid. Heat a large heavy skillet over medium-high heat. Add Italian sausage to pan; sauté 6 minutes or until browned, stirring to crumble. Remove sausage from pan, reserving drippings; drain on paper towels. Add garlic to drippings in pan; sauté 1 minute, stirring constantly. Add 1/2 cup reserved cooking liquid to pan; bring to a boil, scraping pan to loosen browned bits. Stir in 2 tablespoons olive oil; cook 30 seconds, stirring constantly with a whisk. Add pasta to pan; cook 1 minute, tossing to combine. Remove from heat. Combine about 2 tablespoons cheese and 4 3/4 cups parsley leaves in a food processor; process until finely ground. With motor running, add remaining 1/4 cup cooking liquid and remaining 2 tablespoons olive oil; process until smooth. Add parsley mixture and salt to pasta; toss well to coat. Divide pasta mixture evenly among 4 shallow bowls; top evenly with sausage, remaining 2 tablespoons cheese, and remaining 1/4 cup parsley leaves. Serve immediately. As I have mentioned before, it’s not that I actively dislike traditional pesto, it’s just that it tends to over power anything it comes in contact with. While I love basil, garlic, pine nuts, etc… the combination of such in a traditional pesto is just, well, too much sometimes. And while I dearly love the Arugula Pesto I posted almost a year ago https://donnasquickqi.wordpress.com/2012/06/03/weekly-winner-pesto-perfected/, it was time for a change. Enter Sicilian Pesto. If it is possible for a pesto to be refreshing, this one is. I think it is the mint. The small amount of tomatoes also gives it a nice body without relying heavily on olive oil. Just all around a great pesto. I think my husband’s comment said it all “This is way better than it should be”. Apparently I had higher hopes that he did, but at least it turned out as a unanimous Weekly Winner. I have no idea where this recipe came from. Pulse tomatoes, mint, almonds, pecorino, oil, lemon juice, garlic, and pepper flakes in a food processor until smooth; season with salt and pepper. Toss with pasta of your choice.